This organ belongs to the Fondazione Accademia di Musica Italiana per Organo. The history of the organ is set out in a book about the restoration published by the Accademia. It was built for the Unitarian Chapel at Rosslyn Hill, Hampstead, London. There is an entry in the Hill Shop Book Volume 4 p.75 (British Organ Archive, Birmingham Central Library). The job number is 2190. The presence of the job number 2186 on parts of the organ leads to the organ at Stretton near Burton on Trent in Staffordshire, a very similar organ. The organ was bought by the Accademia in 1997. When Martin saw it in 2002, it appeared to be largely intact, but in an amazing pile of bits. The general condition of the organ was quite good, though it had been dried out while still at Rosslyn Hill. The wind chests particularly had to be dismantled and restored. The pipes had been mishandled, but the voicing was generally unaltered. Three of the stops had been replaced in the 1970s – contemporary stops were found to replace them. The case had to be extended, as it was originally in a chamber and is now free-standing. The organ was inaugurated with a late Victorian evensong performed by the Welbeck Singers, with Naomi Gregory on organ, in the presence of notables from the town of Pistoia and the Fondazione. 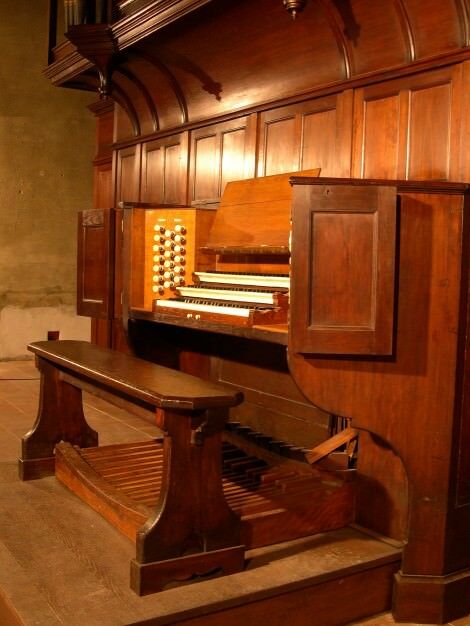 Our involvement with the organ was the responsibility of Christopher Stembridge and Pier Paolo Donati. Martin Goetze was in overall control of the restoration project. Apart from our team, we were assisted particularly by Clive Sidney, whose wife comes from Pistoia, by Warren Marsh and Mark Booth. Chris Wells stained the new woodwork to match the old. The manual key compass is C – a³, pedal C – f¹. The pitch is A440Hz at 18°C. The tuning system is Equal Temperament.